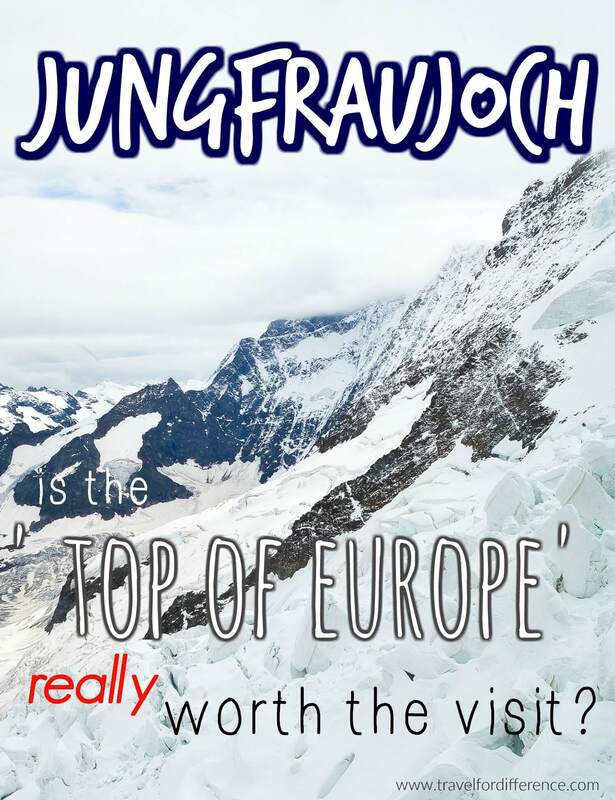 JUNGFRAUJOCH – IS THE ‘TOP OF EUROPE’ REALLY WORTH THE VISIT? 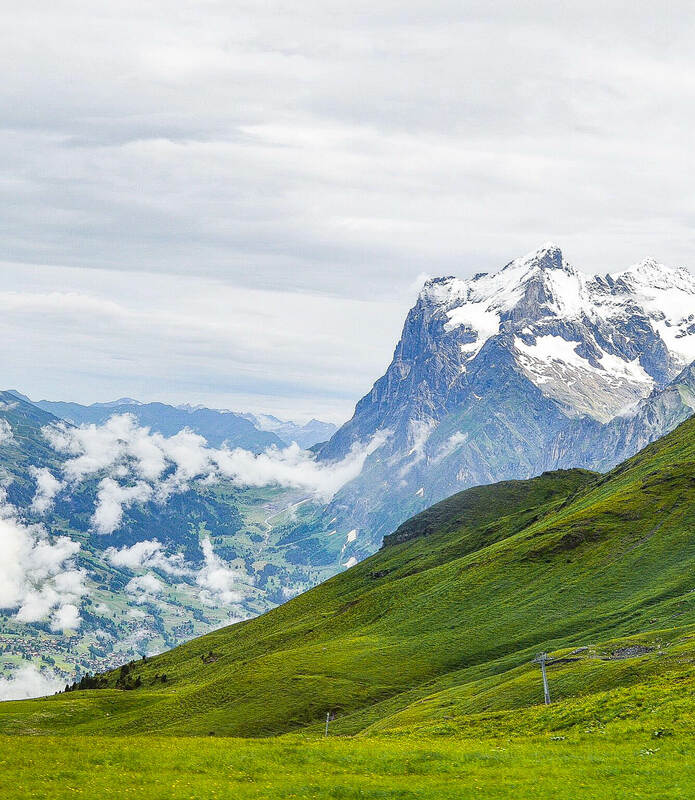 Switzerland – the mountainous central European country surrounded by luscious landscapes, thousands of cowbells and rugged snowy peaks – is also home to Jungfraujoch; also known as ‘the Top of Europe’. 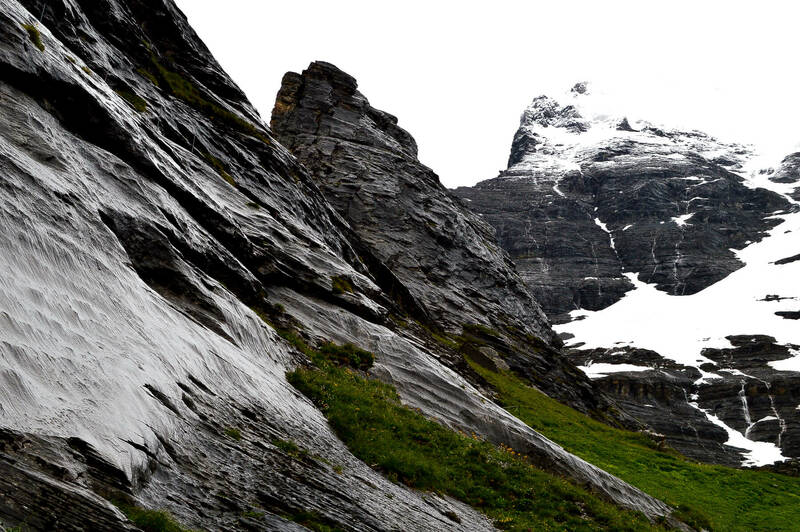 Jungfraujoch is a saddle that rests between two peaks, which both reach elevations of over 4000 metres – Jungfrau and Mönch. Nestled in the Bernese Alps, Jungfraujoch is the highest viewing platform in the continent, standing at 3454 metres above sea level with close-up views of the Aletsch Glacier. 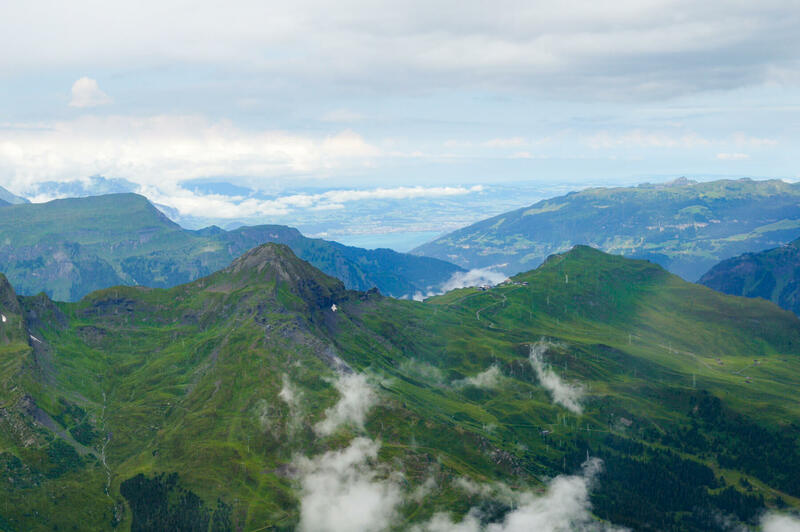 The journey to the Top of Europe begins in the resort town of Interlaken – a beautiful location in the alpine region that lies on a narrow stretch of land between two turquoise lakes (hence the name, Interlaken). 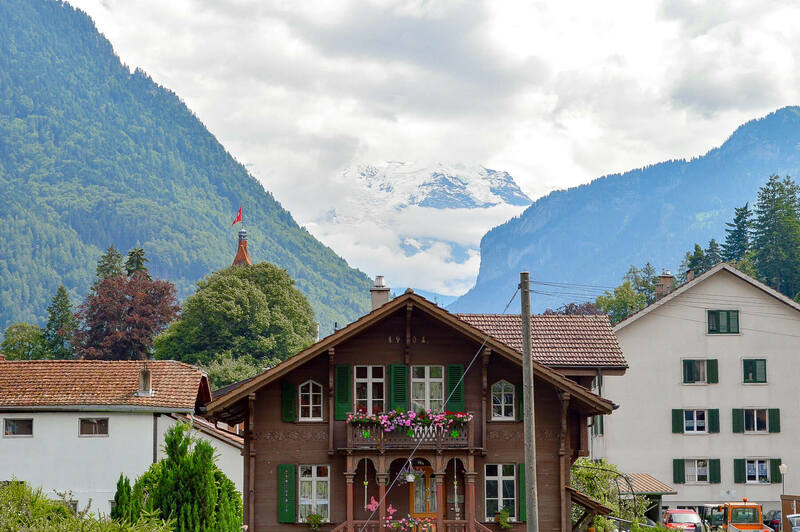 Interlaken in itself is a place that I certainly recommend visiting. 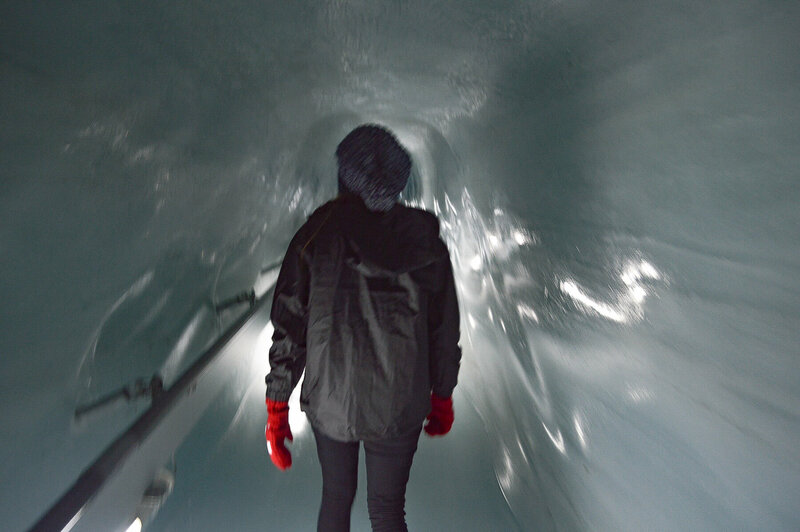 A tranquil town surrounded by some of the most beautiful landscapes I’ve ever seen; adventurous activities, incredible attractions and best of all, breathtaking views of the iconic Jungfraujoch! To reach the Top of Europe is not as simple as what is most commonly thought. Tickets are to be purchased in advance (not unusual I suppose) but getting there requires 2 hours of extreme train travel. Although a 2-hour journey may not sound all that appealing at first thought, this is one that will really leave you speechless. 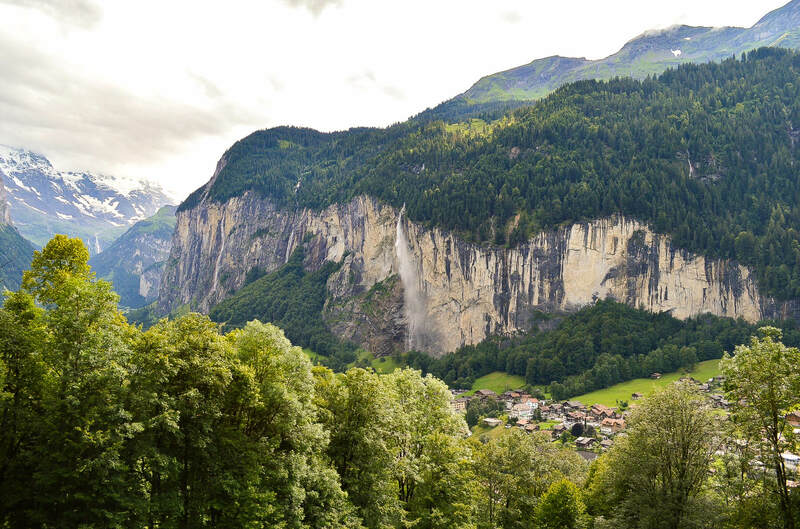 The views from the train are of the famous Lauterbrunnen Valley, some of the biggest waterfalls you will ever see, snowy mountain peaks and distant views of Switzerland’s beautiful landscapes – Nature at its finest! The journey has 2 routes which both begin in Interlaken-Ost. 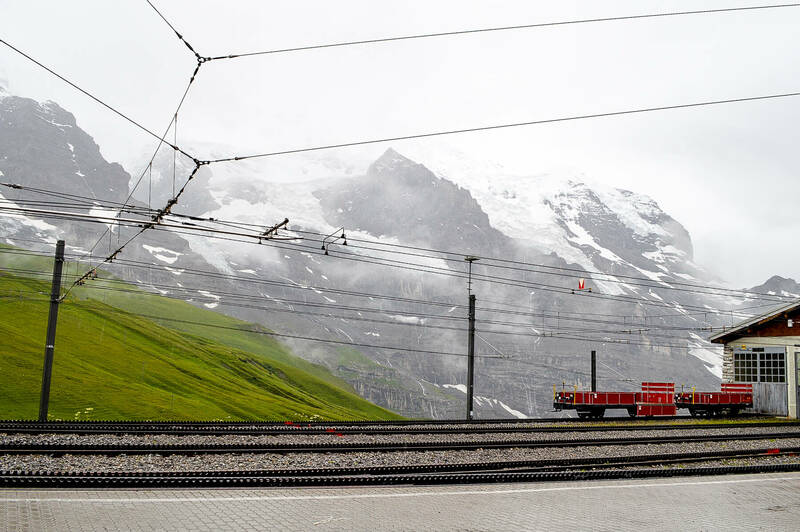 From there, the train stops at Kleine Scheidegg via Grindelwald or Lauterbrunnen. I highly recommend taking the Grindelwald route on the way up and stopping at Lauterbrunnen on the way down to see the beautiful valley in all of its glory – You really don’t want to miss it. The last leg of the journey from Kleine Scheidegg, is spent in the darkness whilst travelling through the middle of Eiger (I know. It sounds a bit like a location in the Lord of the Rings). This duration is spent in a dark tunnel on the way to the final destination – but don’t fret! – The two short stops along the way have some of the most memorable views I’ve ever experienced. The 2 panoramic windows at each stop give views of the famous Eiger North Face and the rugged snowy valley of Eismeer (feature image). Now. 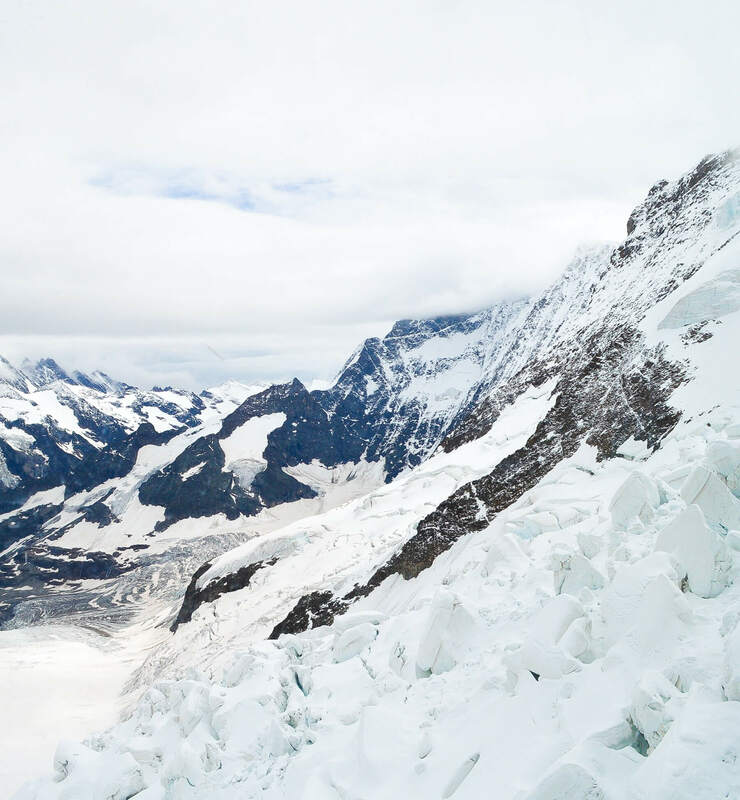 When you see images of Jungfraujoch, you imagine a feeling of literally being on top of the world. You think you’re going to see a surrounding of magical glaciers, distant views of the forests and the town in which your journey began. Nothing but my own reflection in the glass of the platform, a foggy white haze in which I couldn’t see my own fingertips, and only what was a few short metres in front of me. A disappointment? You could say so. 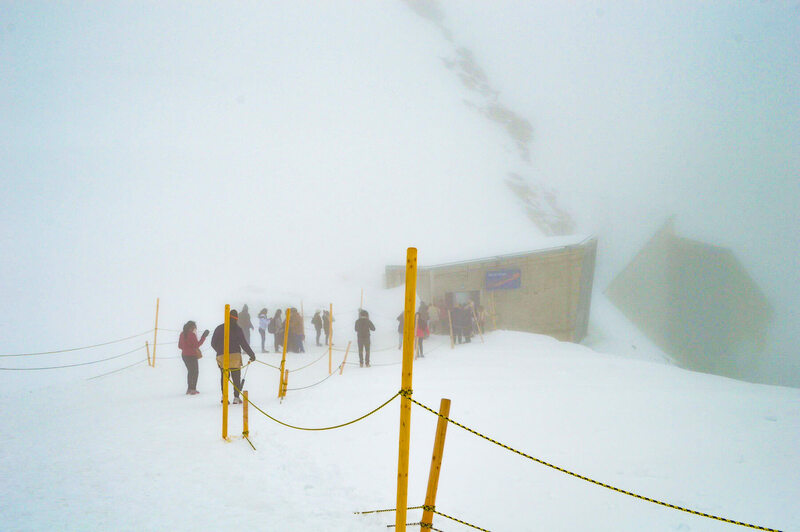 The day we ventured to Jungfraujoch was completely clear down in Interlaken, but when you reach over 3k in elevation, there really isn’t any guessing on how the visibility will be. Luckily in my books, there are always adventures to be had, so there weren’t any Debbie Downers here in the Alps… That’s for sure! At the platform, there was much more than just a viewing deck. At 3454 m, this centre still has a Lindt store, cafés, shops, an ice tunnel, children’s activities and more. After waiting inside for a while (hoping that the skies would clear) it was finally time to venture outside into the wet, cold and foggy conditions. My nose was bright red, my hair was a tangled mess, my ankles were frozen and my feet were on the brink of having hypothermia… but hey! Who doesn’t want to make snowballs? 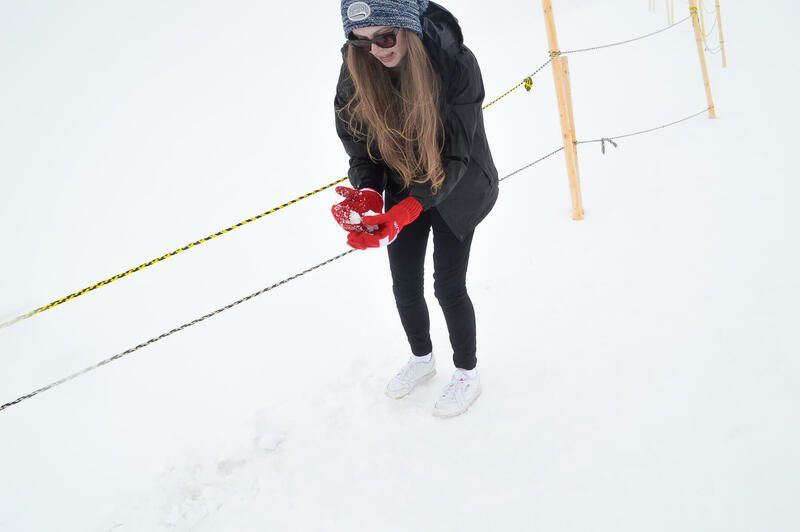 My partner had never experienced real snow before (Australia is pretty pathetic when it comes to snow) so this was one of the most amazing times for him. Although we could hardly see a thing, the adventures were just as memorable as what the views potentially could have been. After almost turning purple, it was eventually time to venture back inside, buy some chocolate and head back down the mountain. Although the views were no way near what I had hoped for, the journey is what that I’ll always remember. Seeing the rugged Alpine region of one of my favourite countries in the world could never be experienced any other way. The weather is very dependent on the experience Jungfrau’s guests will have, but as I’m sure you’ve probably gathered, there are many incredible reasons to visit the Top of Europe, but it’s the journey that is the part you’ll never forget! Such a shame for you about the weather up on top, were you visiting in winter? I went a couple of years ago in Summer and the views are amazing!